Grilling is the perfect confluence of art and science, engineering and craft, mind and spatula. The French saute, braise, and poach. They do not grill. MEN grill. This MAN-E374BBQ instant read digital temperature gauge lets you monitor grilling conditions for a wide variety of meats making it an ideal grilling companion. The meat thermometer features a quick 5-second response time for a more accurate readout. Activating the hold function will force the current displayed temperature to remain on the thermometer, even after the stainless steel probe is removed from the meat. 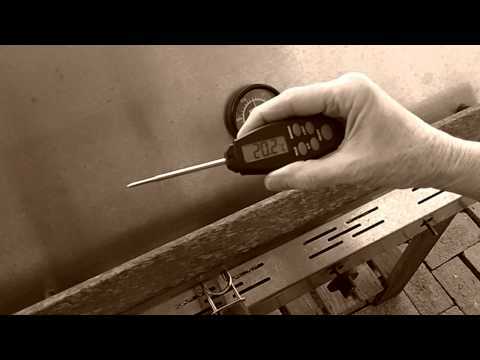 The min/max feature allows you to fine-tune your temperature preference, for results that fit your grilling style. No need to be a rocket scientist to figure out this temperature gauge and if you forget to turn it off it has an auto-off feature. The backlit digital display shows temperature readouts with a wide range from 32 to 392 degrees Fahrenheit and the readout works in Celsius or Fahrenheit modes. The included batteries get the grilling going quicker, and the sheath protects the stainless steel probe from wear and tear during storage or transport.